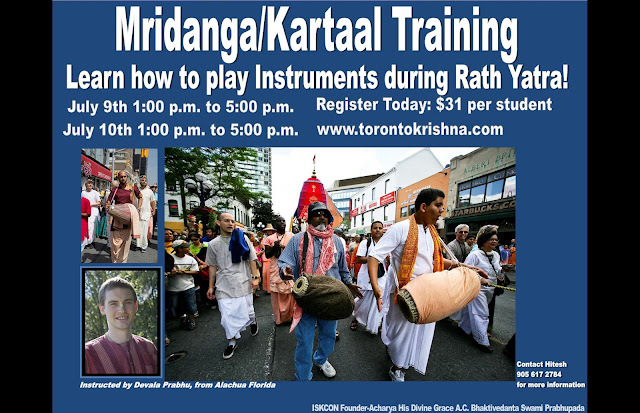 Special "Ratha-Yatra" Mridanga Course - July 9-10, 2016 ~ The Toronto Hare Krishna Temple! Due to an outstanding response from our previous mridanga course, the Toronto Hare Krishna temple is proud to announce another training course which will happen on July 9th and 10th. This course will teach karatalas (hand cymbals) to beginner students of mridanga, and mridanga to intermediate and advanced students of mridanga. As an exciting idea, students who attend this course will be able to play their respective instrument(s) during the Ratha-Yatra parade which will happen on the next weekend! We are offering this training at a very minimal cost of $31. Don't miss out on this amazing opportunity! Details in the poster image below. Hello I am not able to sign up. Where is the link? The form has been placed up!